Thank you very much for the lovely comments - Blue Ensign / Landlubber Mike / SpyGlass / Tigersteve / probablynot and to all those that pressed the 'like' button. Thank you. Yes it is a shame the metal castings are not good. The blue is the French navy blue with quite a bit of white, some black, and bit of red. The white waterline was sprayed with acrylic matt paint. First with a couple of coats of grey primer, sanded then couple of coats of the white. Then clear matt lacquer. So as to not to get any bleed under the masking tape - having stuck the tape down - I paint on along the edge of the tape (that the new paint goes up to) the colour that is under the masking tape thus sealing it. In this case it was clear matt lacquer. 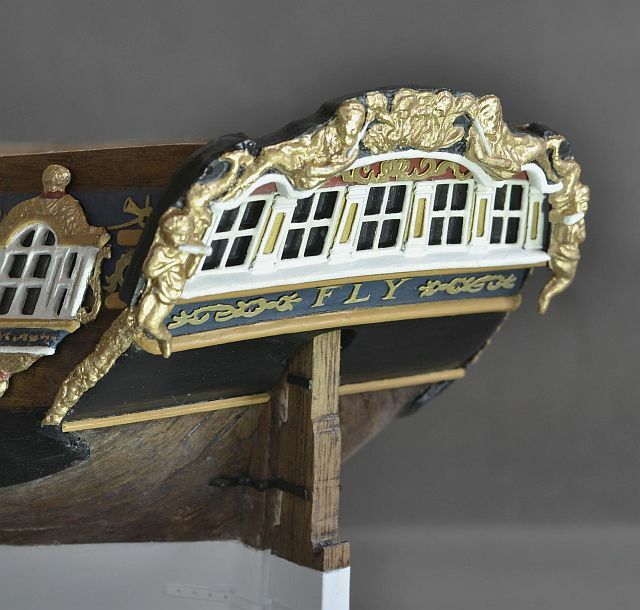 probablynot - maybe Pegasus might be a better build as the fitting may be better and you will have master builders (Blue Ensign / Landlubber Mike - among others ) to follow. Talking of great builders - what has happened to Aliluke (Alistair)? Nicely done, Doug, nicely done indeed. I would have been afraid to use spray paint, but your strategy of laying a coat under the tape sound ingenious. Spy's right about those fittings, and they don't get any better. We all miss Alistair's contributions to the Fly/Pegasus community. But as a working man myself, I know how hard it can be sometimes to get to the boatyard for any extended work. Beautiful build, Doug! It is a pleasure to watch! Stern windows fitted plus window ledge. The decorations above in arched section left off as they did not quite fit in - besides it was nice to see some of the red colour. Still a bit of touching up needed as glue is showing. 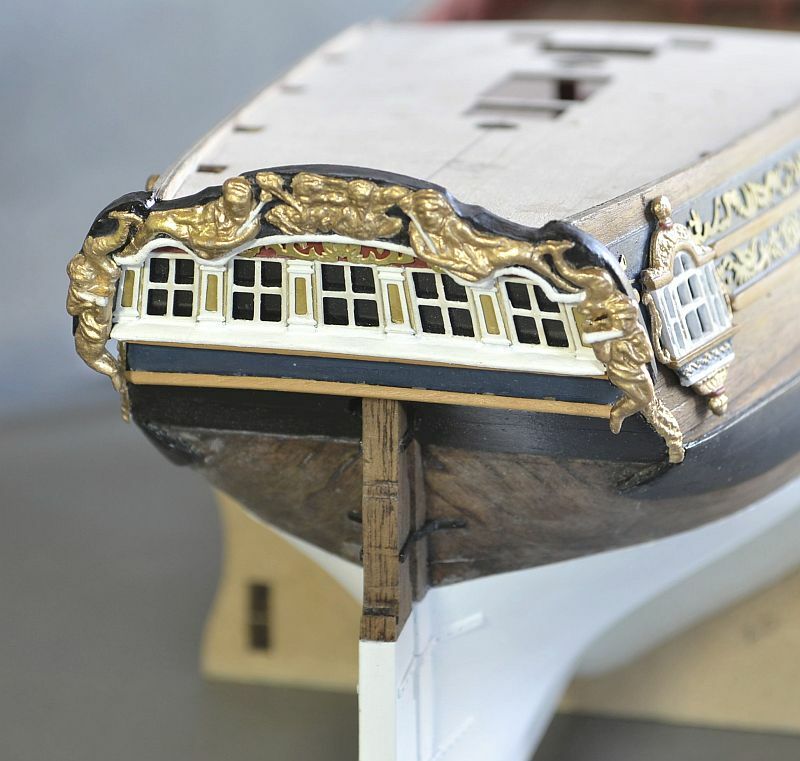 The side decorations were snapped in two places so as to get them to fit the curve of the hull and I can see in the picture that I haven't hidden the join so well. Thanks Gahm for looking in and the nice comments. Just wished I could take really close up pictures without showing some wobbly work unlike your incredible work which really is a pleasure to see. Also thank you Martin W.
Couple of other great builders - vths and pnevrin - seem to have disappeared? Finally the stern done. Lost the letters a few times - hours on hands and knees searching. Glad to have them stuck down. Nice looking stern, Doug. That position on hands and knees seems to be one we all grow accustomed to. Generally I find what I was looking for months later when I'm looking for something else. 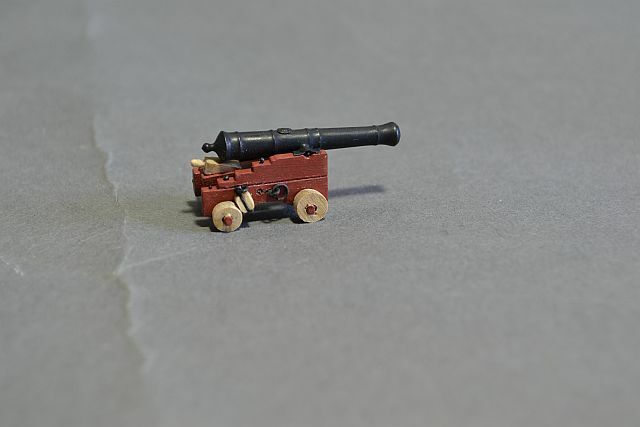 Hello - have been assembling the cannons this last month. 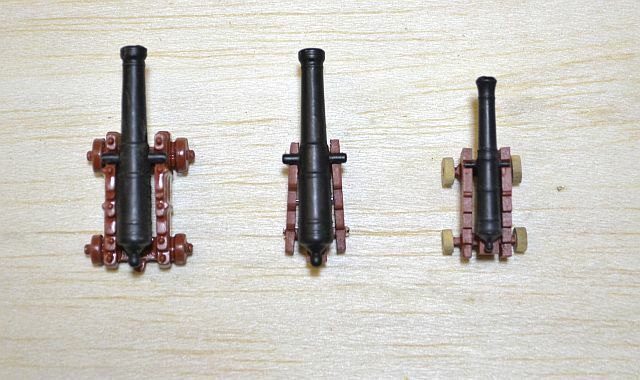 The 6 lbs cannons and carriages I have used are from the Syren company and the picture below shows the kit supplied metal carriage and cannon, the upgrade kit carriage with original cannon, and the Syren carriage and cannon. Felt I could have done with something slightly larger than I had. Syren 6 lbs carriage and cannon partly rigged, using 2mm block supplied with upgrade kit, black tape used for the brackets holding cannon to carriage and 0.4 rivets (from model train shop) on the top of the carriage. Thank you for the previous comments and the likes. 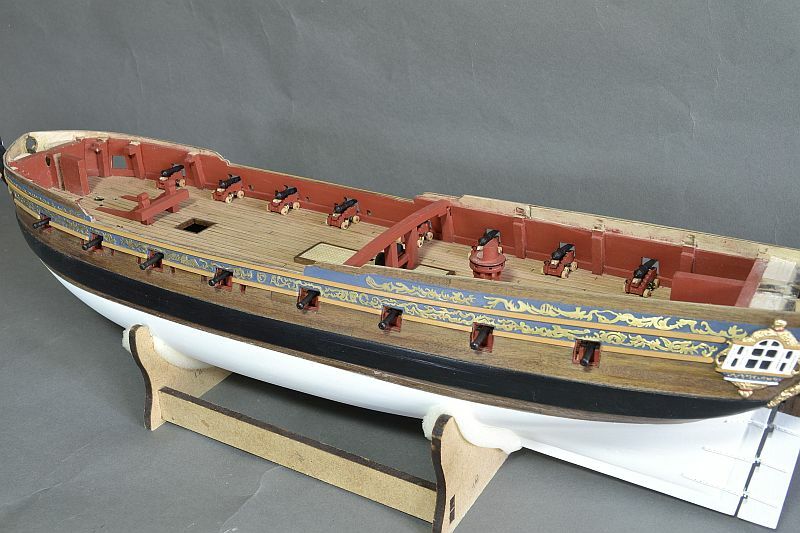 Nice progress Doug, the Syren guns are a big improvement over the generic Amati ones, and they look to be well positioned within the gunports. I agree with BE - the Syren guns look much better. Amati does such a nice job with the kit, it's a shame that they use out of scale guns. 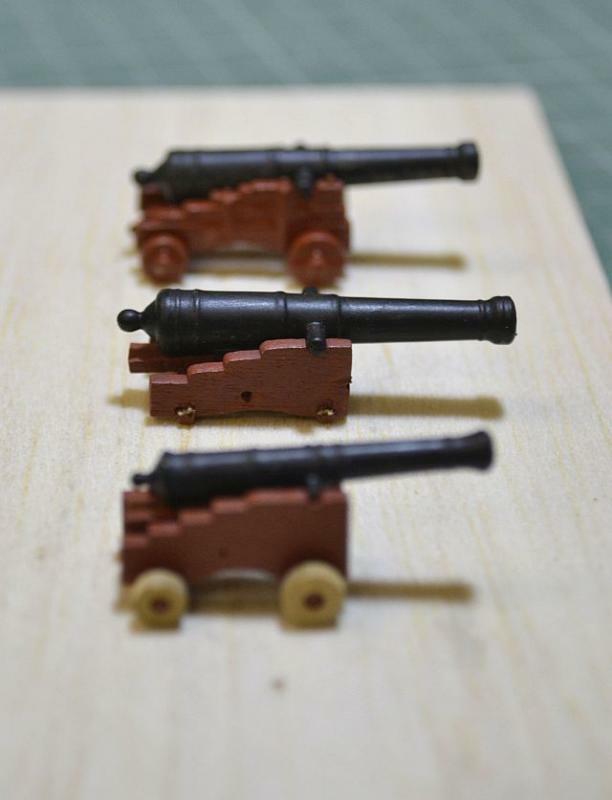 I replaced my cannons with ones from RB models which are pretty close to the Syren ones in size and shape. Hello and thank you Blue Ensign and mcpesq817 for the comments concerning the cannons. It is good there are other suppliers for these things otherwise we would have to make do with the kit supplied bits. The 8 cannons below the upper decking rigged - using the upgrade kit 2 mm blocks and rope. The galley stove was made from a block of balsa wood then covered with thin plywood. Cross beams, Partition, capstan etc fitted in place. Well done Doug going the extra mile by fully rigging the 'hidden' guns galley stove looks excellent, have you checked how it relates to the Chimney position and steam grating? Thank you Blue Ensign - yes I have checked 🙂 And the stove is just dry fitted at the moment and will get it right when putting the upper deck in place. Hi Doug -- Oh, don't apologize for giving us lots of pictures! That stove looks very nice -- and solid. And a good job with the guns. Thank you Martin. And the stove looks a bit too long as I think Blue Ensign had spotted that and I am embarrassed to admit. It does sort of sit under the chimney position but does really need to be moved over a few mm but would cause a problem with the mast bits . This is presuming I have the stove going in the right direction. Have followed Martin W and Aliluke on this but have noticed Aliluke changed his around. If it should be the other way round then the length is good but height not so good due to the overhead beam. Anyway thanks for the looking and comments. Well that is really a very nice job all round -!!! Doug, my Stove is positioned wth the chimey forward, it is the only way it would fit. I pondered over this for some time but came across a reference to stoves sometimes facing that way. I did notch out the beam to allow for the steam grating to sit without the beam blocking it from beneath. I did quite a lot of modifications beneath the Foc'sle deck one of which was to provide sockets on the underside of the deck to take the legs of the Foc'sle bitts. This meant that the legs didn't extend down to the upper deck and would not therefore block your stove whichever way you positioned it. Thank you B.E for the help in this matter concerning the stove. It has been a bit embarrassing not to have really checked everything through while building the stove. Have decided to turn the stove around, adjust the beam and this way it gives more room around the stove so it looks like it could be used. Again thank you for taking the time to explain. Unfortunately was unable to find your stove to see what you had done on your build I guess due to sad problems with the sites upgrade..
here's the link I think. Aha - found it and have found out something else. As I have very bad internet here when I have been flicking through your log no pictures so did not see any stove. Today left the page (link supplied) open for half an hour and wow - pictures started to appear. Technology eh? Now I can get back to study rest of your build - and be patience knowing the pictures will be there. Must add that it seems only on your log and the early part I have this problem. Just thought the mishap with the site upgrade had lost your pictures. Hi Doug -- I worried over the direction of the stove for quite a while. Finally, I got the bright Idea of looking at the NMM plans and placed it accordingly. As I was making the stove, I did find that it was going to be longer than the space allowed, so I had to modify it. In the end, it's tight no matter what. Hello - Been busy doing the Bow part. Quite challenging to say the least!! 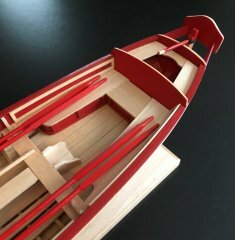 Upper decks planked - the quarter deck just placed and not glued down. Cheeks painted blue so where ever the decoration appears it has always on a blue background. The instructions ask for black. Next - will do guns on the lower deck and then back to the quarter deck. Thank you very much Mirabell61 and Tigersteve for your comments and to those who pressed the 'like' button. Mirabell61 - not seen many white painted hulls either but if I do another build may do copper. Have found on both my builds the white hull had cracks after a few months appearing along the planking. Maybe why most choise either copper or left wood. So before it gets impossible to turn the ship over (mast and rigging started) I repair the hull - gluing / filling / paint etc. On my first build ( HM Brig Supply) the cracks have not reappeared - fingers crossed. Just came across your build and what a lovely surprise. Always liked this model and class of ship. Very well done. It's always puzzled me why Amati left that strange void between the Main head rails, looks so much better with a little framing as your photo's show. 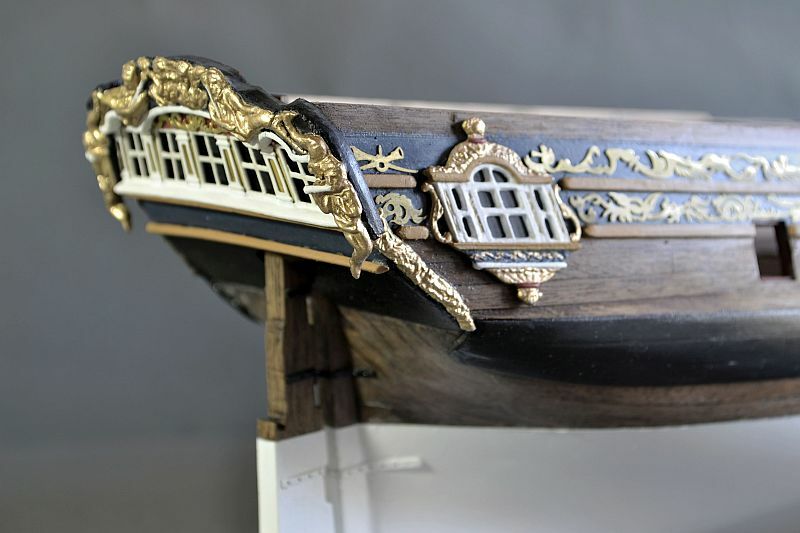 Thank you Tallshiptragic for looking in and your much appreciated comments. I thought this ship had a lot of decorations but seeing your amazing build I realize you cannot have enough ....... 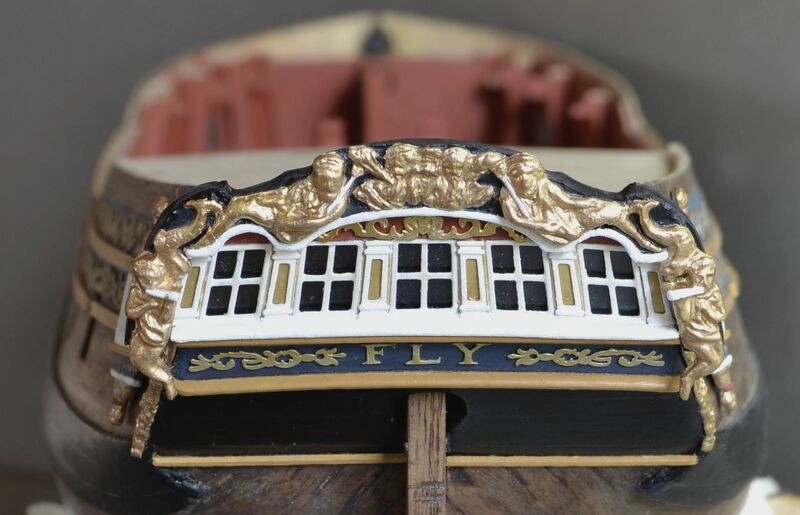 I have struggled with the the brass decor on this build and having tried unsuccessfully to put the trim carefully on the cheeks without glue showing have given up. Blue Ensign - again thanks for looking in. The book idea was brilliant - absolutely lovely. Have now rigged the guns - just the coils to do. The pumps and handles are also done. The side screens. A bit clumsy. Got frustrated with the brass trim on the cheeks so took them off. Also for some reason there was a gap on the side where there was no trim yet the plans showed the last section of brass trim went right up to the catheads. As I had some spare from not doing the bow section have placed some bits in. Probably will find later on down the line this will be a mistake. Looking good Doug, colour scheme works very well. These Swans surely do make attractive models. Hi Doug -- Nice work all around. I've been contemplating the pumps on my own Fly, so seeing yours done gives me plenty to study.